The Yavorov Days 2011 were started in Pomorie late last night. Memorial prayer in memory of the immortal soul of the great Peyo Yavorov has put the start of the 3-day celebrations in his honor. 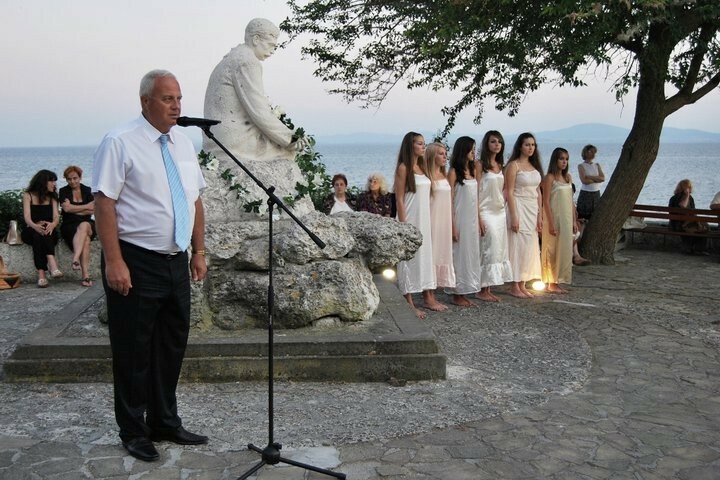 By tradition, the citizens and the guests of the city gathered at the monument of the poet, located close to the sea and paid their homage. As a host, the mayor of Pomorie, engineer Petar Zlatanov, thanked the audience that this year too they are part of an event that began modestly and turned into a national one. "Namely you, who today light a candle in memory of Yavorov, you are the Bulgarian memory. Namely you carry the cultural values and will pass them on to the future generations,” Mr. Zlatanov said. For a consecutive year, guest of the Pomorie Yavorov Days, was the mayor of the birthplace of Yavorov, Vassil Donev. Official speech was delivered by the professor in Bulgarian literature from the University of Sofia, Valeri Stefanov. The festive opening continued of the central square in Pomorie with the play "Salome" by Oscar Wilde, translated by Yavorov and staged by the theater of community center "Prosveta". Yavorov Days 2011 will continue until July, the 16th with a rich cultural program.